"Avalon Hill’s new PC edition of 5th Fleet strikes me as one of the finest board-game conversions I’ve ever seen. The whole game sparkles with crisp, colorful graphics, and boasts one of the cleanest interfaces on the market. Joe Balkoski, designer of the original board game classic, worked closely with project leader Mike Inella, whose Stanley Associates team included veterans with a lot of experience developing software for the military. Everyone concerned wanted to get it right, and it shows. The action takes place in the vast and volatile region bounded on the west by the Gulf of Suez and the Horn of Africa, and on the east by Malaysia. Along with the Indian Ocean, this theater of war also includes all the vital Mid Eastern waterways and strategic choke-points. Eleven scenarios are included, all predicated on the supposition that large segments of the former Soviet Navy become engaged with various client-states in this unstable region. 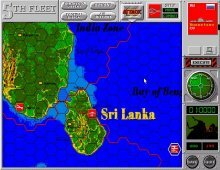 Thus, in addition to the familiar old USSR vessels, the player may find himself confronting Indonesian, Pakistani, or Indian units. Scenarios are graded as to complexity: a low-rated game usually lasts an hour, a medium-rated one lasts two or three hours, and there’s a monster campaign game of 30 turns which includes the possibility of replenishing depleted missile inventories at friendly bases. Starting locations are randomized for each game, so replay value is much higher than "eleven scenarios" might lead you to think. Each game is controlled from a "CIC" screen, where you can select scenarios, configure the game for two-person or E-mail play, and consult the Tactical Reference Monitor, a handy Janes-Fighting-Ships guide that shows a crisp picture of every ship or plane in the game, along with their real-life vital statistics and their ratings in terms of the simulation. Overall battle management is conducted from a strategic map based on satellite reconnaissance data. You can display all known sightings, by type, and vector recon flights to the various tactical zones displayed. When an enemy unit is detected by your sensors, it’s displayed along with whatever information is available about the individual ships in that formation. Tactical action is fought out on richly detailed operational displays, whose hex-grids can be toggled on and off. Each hex represents 50 miles, and the air, sub, and surface unit icons look exactly like their board-game counterparts. Movement is simple. You just click on the unit you want to maneuver and drag the mouse to the destination hex. Combat is also easy to initiate: click on the unit you want to strike with, whether naval or air, toggle the "attack" button, then click on the enemy unit you’ve targeted. A combat display screen will then pop on, and each weapon system that’s capable of hitting a selected enemy target will be highlighted, along with the number of missiles or torpedoes available for firing. Using this well-designed screen, it’s a simple matter to cycle through your ships and assign to them the targets they’re most likely to hit. Animated missiles, aircraft, and explosions add a bit of graphic zip to the combat routines, after which a score screen appears telling you how many of your SSNs hit or missed. Victory points are awarded for sinkings (though not, rather curiously, for damage inflicted) and for convoys brought safely to their objectives. I was seduced by 5th Fleet’s clarity, elegance, and energy. But the more I played, the more I came to respect the way it subsumes an enormous amount of data into such a playable engine, and then slowly reveals the subtleties implicit in that database through the growing experience of the individual player. After the first time one of your task forces is gutted by a submarine you didn’t know about, you’ll learn the value of mixing into your CAP deterrent a few planes with high "sub detect" ratings. After grooving on the rush of launching a veritable rain of SSNs on the first tempting target in range, and then finding yourself, two turns later, out of Harpoons and cornered by a fresh enemy task force, you’ll learn that, for all their lethality, surface-to-surface missiles can only be carried in limited numbers -- and the admiral who fires them off as though they were five-inch shells is not likely to survive. You’ll learn to horde the arrows in your quiver; the importance of using range limitations to your advantage; the weaknesses and strengths of ground-based air support; the crucial importance of locating the enemy before he locates you; and the shocking suddenness with which a seeming victory can turn into a crushing defeat. Certainly the best way to play 5th Fleet is against a human opponent, either in the flesh or by E-mail, but the computer AI fights a very competent battle. If you set the AI on "aggressive," you’ll probably experience a significantly wilder battle than on the "nominal" setting -- indeed, the "aggressive" computer admiral tends to attack furiously, hoping to score a knockout early on. If you can survive his onslaught with sufficient units intact, you can probably slaughter him with counterattacks, because he will have burned up most of his magazines. This handsome, engrossing PC version will certainly satisfy the many fans 5th Fleet has gained as a board game. Naval enthusiasts who just aren’t in the mood for Harpoon’s complexities, or who are looking for a naval-war game that can be started and finished in a single evening, will find it a delight. Well done." Two thumbs up, way up!